One of the great pleasures of scanning old negatives is that you never really know what the photograph will be until it appears on the computer screen. You can get a glimpse by holding the negative up to a light, but it only gives an outline of the photograph. I recently scanned a series of my father’s negatives covering photos taken in 1953 at the time of the Coronation. It was interesting that there were no photos of the main participants of the Coronation, the photos instead being of the people waiting to watch along with other photos of Londoners at around the same time. So for this week’s post, I present a series of photos showing Londoners from 1953. 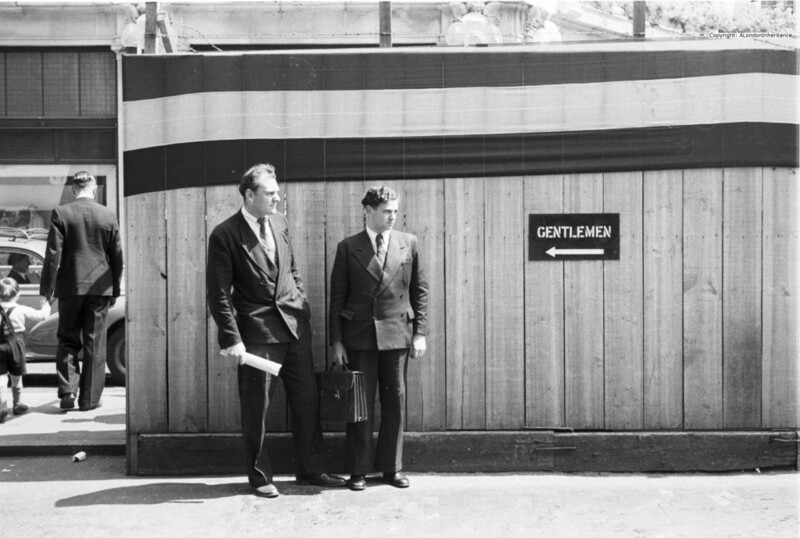 I have no idea where in London this photo was taken, but I suspect an opportunistic photo given the two very well dressed gentlemen and the sign. They are obviously waiting for someone or something, perhaps a taxi? It demonstrates the benefits of always having a camera to hand when walking London, something I always try to do. It is easy to take this type of photo with current camera equipment, even a mobile phone, but the above photo was taken on a camera that had manual focussing, speed and aperture adjustment, and a standard lens so it was not taken at a distance. 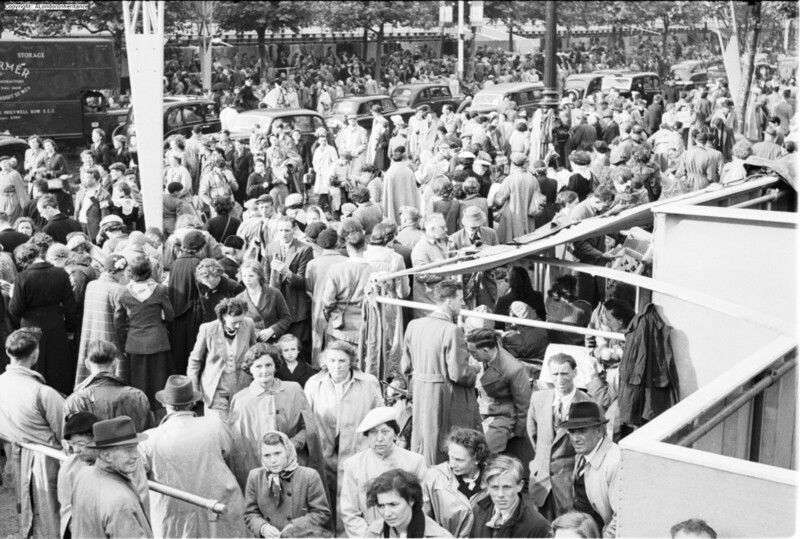 The photo above and the one below are from a series of photos taken of the crowds after, and waiting for the Coronation. My father did not taken any of the Coronation procession, he was much more interested in the people waiting along the route. The photo above shows a very busy Mall between Trafalgar Square and Buckingham Palace. The above photo was taken in Trafalgar Square at the base of Nelsons Column looking towards the National Portrait Gallery. The weather on Coronation Day was not good. Dull skies, a cold wind and occasional outbreaks of rain as highlighted in the above photo. This was the 2nd June 1953, typical British June weather ! The construction on the left of the photo is probably a BBC commentary / camera position. The two men at the top left have headphones on. This was the first time such an occasion had been televised. I do not know where or when this photo was taken, but it was on the same strip of negatives as the Coronation photos. It may show children’s entertainment set-up as part of the Coronation activities. All these children must now be in their mid to late 60s. It would be wonderful to put names to them. When scanning this photo and a couple more of the same scene, I was hoping that my father took a photo of whatever it was that they were watching. It would be great to see what was causing such reactions, but no, only a few photos of the children. This has informed my own photography. Whilst a specific subject may attract your attention when taking a photo, those viewing many decades later will want to know more, not just about the subject, but also about the surroundings, what else was happening at the time etc. This is obviously much easier now with digital photography where the cost of photos is almost negligible, but when these were originally taken film was expensive and my father did all his own developing which was time consuming and costly. I can understand why he only took a few of a specific subject, but many times when I have been scanning I was wishing he would have turned slightly and taken another photo. 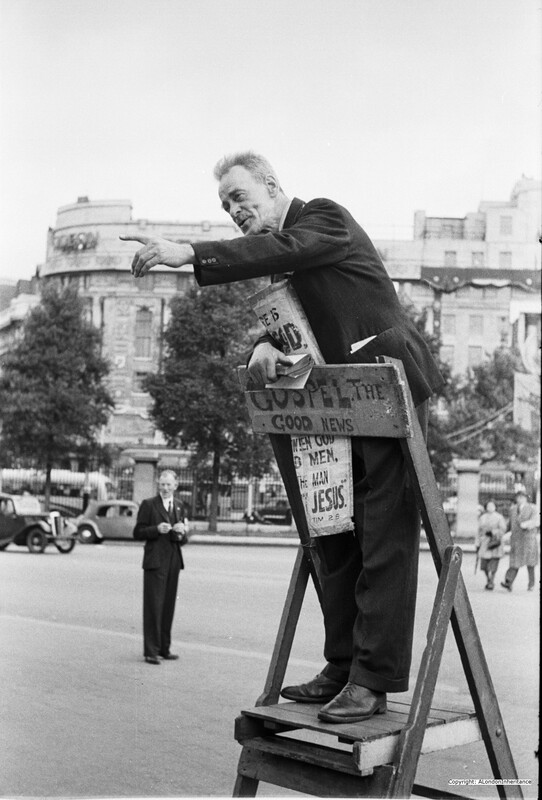 Preaching the Gospel at Speakers Corner. Bible in hand and very intense. This is one of these photos where I wish my father has turned to the left and taken some photos of the crowd. It would be good to see their reaction. 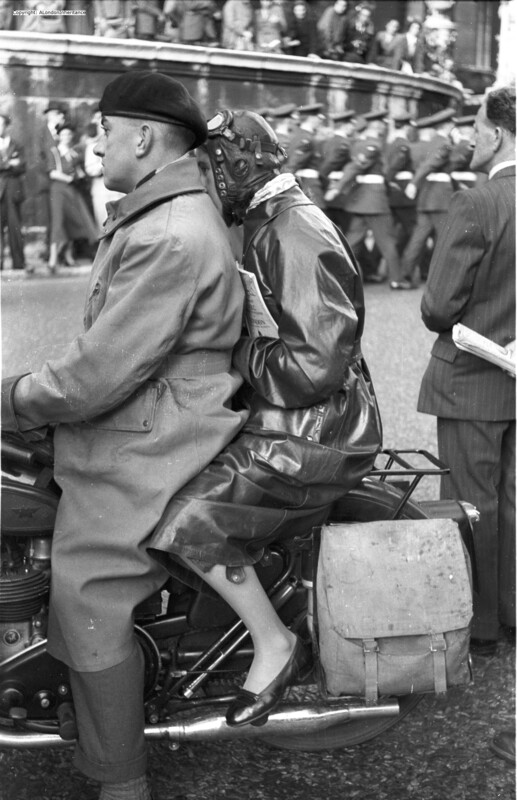 This couple have come up to London and found a position to watch a procession from their motorbike. I suspect they have come from outside central London as the woman is holding an ABC map of London. Not the headgear that you could legally get away with these days. Not exactly suitable shoes for a motorbike, however I wonder if they had come up to London to visit a cinema, see a show or go to a restaurant. 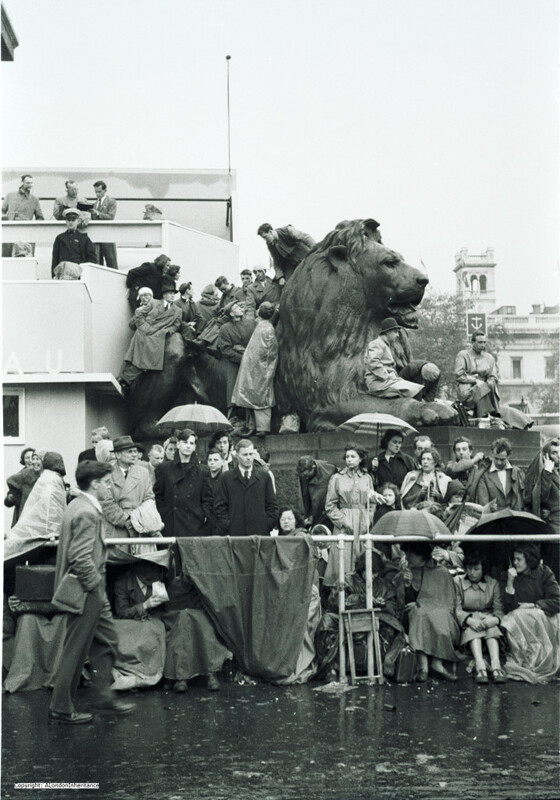 I hope you enjoyed this series of photos of Londoners (and probably visitors to London) from 61 years ago. Snapshots in the lives of people and of this wonderful city of London. This entry was posted in Events and Ceremonies, London Characters on June 1, 2014 by admin. Lovely as always David – I am off to see my parents this week (they are lifelong Londoners, both born in the East End in 1935), and I will show them the Coronation photos and see what they remember of the day. 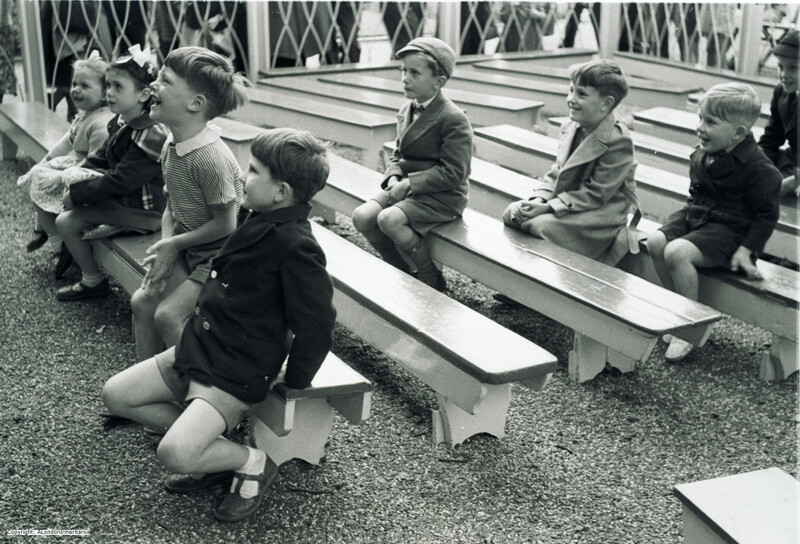 It’s funny how the little details strike home sometimes – the little boy at the front of the photo of the children is wearing T-bar shoes, something that you see very rarely these days, and certainly never on little boys, though I remember them well from my own childhood.